Ronald William Pelton (born November 18, 1941) is a former National Security Agency (NSA) intelligence analyst who was convicted in 1986 of spying for and selling secrets to the Soviet Union. One operation he compromised was Operation Ivy Bells. Prior to his employment by the NSA, Pelton served in the United States Air Force. He was taught the Russian language by the Air Force and served for a time in the early 1960s in Peshawar, Pakistan as a voice intercept processing specialist. After that 15-month tour, he was transferred to National Security Agency, where he continued as a civilian employee upon discharge. Pelton declared personal bankruptcy in 1979 and resigned from his $24,500-a-year job ($84,600 today) with the NSA A Group. From 1980 to 1984 he held a different series of jobs, none within the intelligence community. In 1984, Pelton had faced financial difficulties as a result of increasing homeowners' taxes and a mounting series of necessary repairs on his private residence. Pelton contacted the Soviet Embassy in Washington, D.C. on January 14, 1980 and arranged for a meeting at the embassy. The FBI had surveillance on the embassy and had tapped the phone. Therefore, it anticipated the arrival of the caller but was unable to observe him in time to determine his identity. He was debriefed by KGB officer Vitaly Yurchenko and disclosed Operation Ivy Bells, an NSA and United States Navy program to surreptitiously wiretap undersea cables to monitor Soviet military communications and track Soviet submarines. On trips to Vienna in 1980 and 1983, Pelton stayed at the residence of the Soviet Ambassador to Austria and underwent debriefing sessions that sometimes lasted eight hours a day with KGB officer Anatoly Slavnov. Even though Pelton had left the NSA, he may have continued to be valuable to the Soviets as an intelligence consultant, helping them interpret data picked up from other sources. Pelton had no classified documents to offer but relied on his memory to provide information. He was paid about $37,000 by the Soviets. In 1985, Vitaly Yurchenko defected to the United States and, among other things, recalled that he had met with a former NSA analyst in 1980 and described him as red-haired. The FBI scoured through NSA personnel files until it had a pool of red-haired male analysts. They were thus able to identify Pelton's voice and began surveillance on him in October 1985, but despite bugging his car and his home, they were unable to turn up any incriminating evidence against Pelton. Therefore, the FBI decided to confront Pelton directly, playing the tape of his conversation with the Soviet embassy. Eventually Pelton revealed that he had provided answers to questions from the Soviets in return for $35,000. Pelton was tried and convicted of espionage in 1986 and sentenced to three concurrent life sentences and a $100 fine. Pelton was federal inmate number 22914-037, and was incarcerated at the Federal Correctional Institution, Allenwood, a medium-security facility in Pennsylvania, but spent the last six months of his sentence in a halfway house. He was released on November 24, 2015. ^ a b Jeffrey T. Richelson,. A century of spies: intelligence in the twentieth century. p. 393. ^ "Not Quite Another "Year of the Spy."". July 12, 2013. ^ a b "Ronald Pelton". Archived from the original on May 11, 2008. ^ a b c "Soviet Spy Ronald W. Pelton to be Released from Prison". Federation of American Scientists. Retrieved November 25, 2015. ^ Lamar Jr., Jacob V. (June 21, 2005). "Spies, Spies Everywhere". Time. 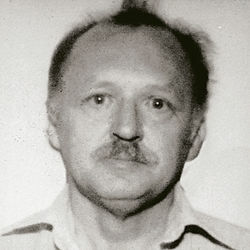 ^ a b "Ronald Pelton, convicted of spying for Soviets, freed from US custody 30 years after arrest". U.S. News & World Report. Retrieved November 25, 2015. ^ "Inmate Locator – Ronald Pelton". Federal Bureau of Prisons. Retrieved October 26, 2015. This page was last edited on 6 March 2019, at 03:07 (UTC).